A federal judge has ruled that a local anti-police-brutality activist has a legitimate free-speech argument to present to a jury about why a former top cop barred her from a weekly “CompStat” data-sharing meeting. U.S. District Court Judge Stefan R. Underhill, a Clinton appointee, agreed in a decision released last week that activist Barbara Fair’s First Amendment rights might have been infringed and the case should proceed. The city had sought to have the case dismissed. Underhill ruled that Fair may proceed to seek changes in policy through her suit, but not any money. The alleged violation stems from a spat two years ago, when the former police chief, Dean Esserman, temporarily shut community members out of the weekly CompStat meetings, after cops complained that Fair used them as a venue to protest the department’s treatment of minority communities. Fair contended that Esserman was trying to bar her from meetings until controversy blew over. The day Esserman barred the public from the meeting — spurred on by discomfort of some of his officers with the presence of a vocal anti-police-brutality activist— he also allowed another member of the community, preacher pal Rev. Boise Kimber, to come upstairs and attend. In his ruling, Underhill squelched Fair’s pursuit of damages, but he agreed to hear her case on injunctive relief. To win the case, the longtime activist must prove that Esserman disliked the content of her speech, rather than the manner in which she gave it, and that he intended to cut off public participation until activists lost interest in using the meeting to speak out. And Compstat meetings, less elaborate affairs since Esserman departed the department, are open to the public again. 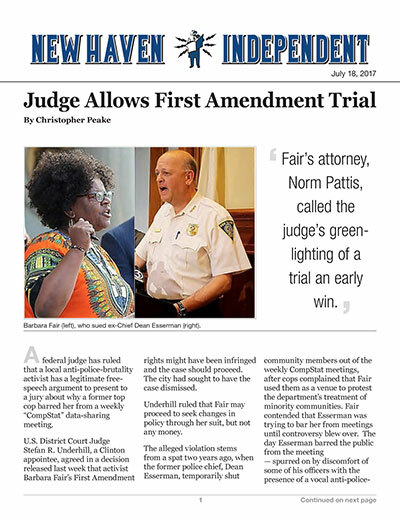 Fair’s attorney, Norm Pattis, called the judge’s green-lighting of a trial an early win. Fair sought to make it a forum. In March 2015, after video of a black 15-year-old’s takedown during an arrest emerged, Fair joined a protest in front of City Hall. There, she allegedly overheard cops and counter-protestors making racially charged remarks. Shortly after, Fair went to a CompStat meeting to speak up. At the meeting’s end, she asked the assistant chief for permission to speak. (Esserman was absent.) Unrelated to any of the discussion that morning, she proceeded to criticize the department and called out the foul-mouthed officers. Fair said that one cop looked upset by her comments, but another officer told him to let Fair voice her concerns. “I know I ruffled some feathers,” she admitted in a follow-up email to the assistant chief. Still, no one present reprimanded her, asked her to sit down or escorted her out of the room. News later reached Esserman, though, that Fair had been “disruptive,” “loud,” and “argumentative.” When she returned to Union Avenue for Compstat the following week, Esserman asked Fair to leave, saying she had made people “very uncomfortable.” After an exchange, Fair said, “As long as it’s a public meeting, I’m going to sit here.” Esserman decided to close it all off. Same thing the following week: Fair and State Sen. Gary Winfield couldn’t even get past the front desk to the meeting. (Rev. Kimber, on the other hand, a friend of the chief, was buzzed in and went upstairs to attend the meeting.) Esserman maintained in his response to the suit there was no ban on Fair’s attendance; she didn’t subsequently try to go back. In his initial analysis of the evidence, in which he tried to give Fair’s arguments the best light possible, as a jury might similarly do, Judge Underhill explained that, to prove a First Amendment violation, the plaintiff must show (1) that her speech was protected by the Constitution, (2) that the forum was public and (3) that the justifications for excluding her speech weren’t up to snuff. Likewise, Esserman’s “admittedly deliberate choice” to open prior CompStat meetings made them “limited public forums,” Underhill added. That’s true even though observers generally didn’t speak, he said. The judge cited a 1991 ruling about ACT UP’s intent to hold a silent protest in a state legislature’s gallery: “[T]he elected officials receive the message, by the very presence of citizens in the gallery, that they are being watched, that their decisions are being scrutinized, and that they may not act with impunity outside the watchful eyes of their constituents,” that precedent said. Esserman argued that, since he opened the meetings, he could have closed them at any time. What are those standards? Underhill said speech may be limited only by “content-neutral” regulations — time, manner, place — unless there’s a “compelling state interest.” In fact, he noted, Esserman might have been on surer footing if he had shut down the public participation entirely. But because the break was only temporary, it implied that the chief didn’t like what Fair had to say on a current event, the judge noted. He referenced several rulings that arbitrariness and unpredictability about when a forum is open to the public can easily cover up censorship, as in choosing to shut down a park on the day a particular person is scheduled to speak. “It seems clear that a temporary shutdown intended to stifle discussion on a particular topic, with plans to reopen the forum after controversy surrounding that topic had been suppressed constitutes impermissible censorship under any First Amendment analysis,” Underhill wrote. Esserman argued that the case is mooted, to some extent, because he’s no longer on the job. Indeed, at this past Thursday’s CompStat meeting, the new chief, Anthony Campbell, said the meetings are open to the public. The only restriction might be if journalists are asked not to publish information about an imminent apprehension, he said. A trial will likely be scheduled for sometime in the fall, Pattis said.